Green Cleaning is "cleaning to protect health without harming the environment." A Green Cleaning program goes beyond chemical and equipment choices. It includes policies, procedures, training, and shared responsibility efforts that "minimize the impact of cleaning materials on the health of building occupants and protect the environment as a whole," according to the Green Cleaning Network. Why Should I Consider Green Cleaners? 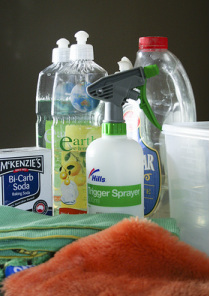 Reduce the number of toxic chemicals in your home or business. Some traditional cleaning products have been linked to dermatitis, asthma, and hormonal system complications. Protect people who use the cleaners regularly. "Members of the custodial staff, especially women of child-bearing age, are particularly susceptible to health problems caused by their frequent and close interaction with cleaning chemicals and equipment. In fact, six out of every 100 custodians are injured on the job each year," according to Green Clean Schools. DeSantis Janitorial Supply carries Enviro Solution products. Shannon DeSantis, (800.942.1656), does presentations all the time with knowledgeable assistants. Janitors Supply carries Spartan green products. Green Cleaning Network is "a nonprofit clearinghouse dedicated to sharing information, stimulating discussion, and educating the marketplace in order to accelerate the adoption of green cleaning for the benefit of human health and the environment." Green Clean Schools explains the health importance of using green cleaning products in schools and contains answers to frequently asked questions and links to past webinars. The U.S. EPA's Design for the Environment program "helps consumers, businesses, and institutional buyers identify cleaning and other products that perform well, are cost-effective, and are safer for the environment." DIY Green Cleaning Recipes: See various DIY recipes for green cleaning from Good Housekeeping.